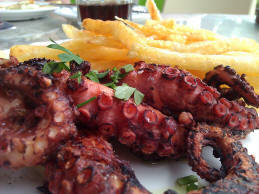 All people love their food, the and the Cypriots are no exception. Around Coral Bay you'll find a huge range of different types of food available. Andria Restaurant - Located right on Coral Bay Avenue this popular option serves everything from international standards to local delicacies. Calamari from the local seas, British style battered fish an chips, Greek salads with feta cheese and Seafood pasta dishes are all on the menu. With inside air-conditioned seating it's a great place to escape the heat for a lunch, or for a relaxing dinner after a day on the beach. Spice Hut - Further inland at 24 Laxion Avenue towards Lara beach this self contained restaurant is an eclectic mix of Indian and Chinese influences with authentic dishes from the subcontinent served at white table-cloth tables and heavy carved dark wooden chairs under slowing rotating fans. Or sit outside in the courtyard beside the fountain to enjoy the fresh air with your spicy food. Oniro By The Sea - Want to dine with great views of the Sea, with the Coral Bay Sea caves in view? ONIRO By The Sea is an original cool bar with unmatched views of the sea caves. A place where you can unwind with delicious bites, original cocktails and refreshing ideas. Opening at noon it stays open until 11pm. The open air terrace makes the perfect location to watch the sun go down over the sea at the end of a busy day. Coral King - Located on the main Coral Bay Avenue this is one of the well established eateries with traditional Cypriot live entertainment in the evenings. Paragka - With mood lighting in the evenings and live modern music play this is a cool place to eat dinner, while in the day the fresh and open restaurants is a breath of fresh air. Try the salads or the steaks! Phidias Cyprus Tavern - This typical Cypriot restaurant features both and indoor seating area and an air-conditioned enclosed terrace where traditional foods and wine are served. Pizza Hut - For a little reliable fast food consider the Pizza Hut which is on the main strip at Coral Bay Avenue.